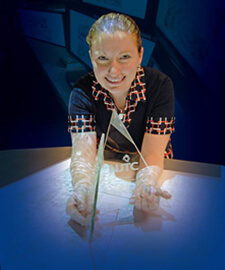 Lauren Landrigan, BS in Software Engineering, 2004, MS 2007, is a computer scientist with the Department of the Army, Aberdeen Proving Ground, MD, and a PhD student at Stevens Institute of Technology in Hoboken, NJ. I started at Monmouth University in 2000. I was part of the first class of undergraduate Software Engineering majors and the only female student in the program at the time. I always had an interest in computers, and in high school I even dabbled in some programming. Sometimes it was difficult being the only girl, and I didn’t always like the attention I received. The professors in the Software Engineering Department at Monmouth were very supportive of all their students and gave us all the resources we needed to succeed. Over the last ten years, Monmouth University has given me so many great opportunities. After graduating from Monmouth with my undergraduate degree, I was hired as a computer scientist at the Software Engineering Directorate at CERDEC, Fort Monmouth NJ. I develop various command and control software applications for the Dept. of the Army and work as a Software Process Improvement Location Facilitator. The classes at Monmouth University in the software engineering curriculum, including the requirements engineering and software process improvement, helped me greatly in developing plans and procedure documents for my organization. In the fall of 2004, the Army sent me to back to Monmouth University to continue my education in Software Engineering. While working on my master’s degree, I worked with the Center for Rapid Response Database Systems (now known as Rapid Response Institute or RRI) developing low-cost applications for emergency operations centers (EOC). I worked with Professor Robert Kelly to develop the software for E-Vest Application. The E-Vest Application uses RFID tags to identify various roles in the EOC. The people in the EOC wear special vests embedded with RFID tags that designate their roles. When the user steps in front of a monitor hooked up to an RFID ID reader, the monitor displays information pertinent to their role using the RFID tag to identify them. 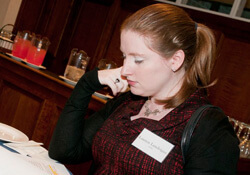 Lauren Landrigan participated in the School of Science Career Choices Roundtable event in Spring 2011. After graduating with my master’s degree in software engineering, I was approached by Dr. Tepfenhart and Dr. Reagor, Director of the RRI, to continue my education and research at the RRI. With the support of the RRI, I am now a doctorial student at Stevens Institute of Technology. My research will be focused on trust and credibility in the EOC, and I plan to graduate in 2015. At the same time I entered Stevens, my husband (who also works for the Army) and I moved to Maryland. Since Fort Monmouth is scheduled to close, our jobs were relocated to Aberdeen Proving Ground in Harford County. Most of my classes at Stevens are online, so this has not affected my studies. After living near the shore our whole lives, we are working on adjusting to the Chesapeake Bay area.